Frilford Heath Golf Club is regarded as one of the best golf venues in the South of England with three championship golf courses set in 500 acres within a conservation area on the edge of the green belt. 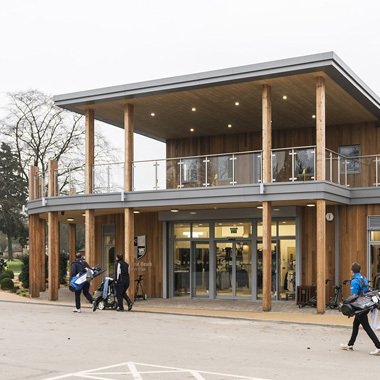 In 2016 the Club held a competition for the design of a new golf retail experience and performance centre. MEB Design’s winning entry was based on the swing of a golf club and the shape of a golf ‘driver’ head. Solid timber specialist, Eurban, worked closely with MEB Design from early design stages (RIBA Stage 2) using advanced DfMA methodologies to seamlessly deliver the new building from initial concept to completion. The building is formed of a CLT superstructure and an external colonnade of 27 glulam columns which provide support to the upper roof and first floor terrace which in turn cantilevers over the columns to create solar shading on the south elevation. The columns extend up above terrace level where they house the glazed balcony protection screens. Aesthetically the glulam columns are intended to blend the building to the backdrop of trees and surrounding landscape and to assist with wayfinding. 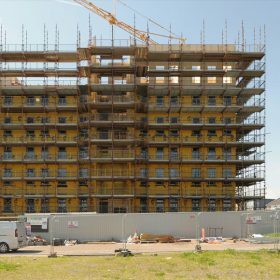 Using CLT for the superstructure helped to reduce delivery time. 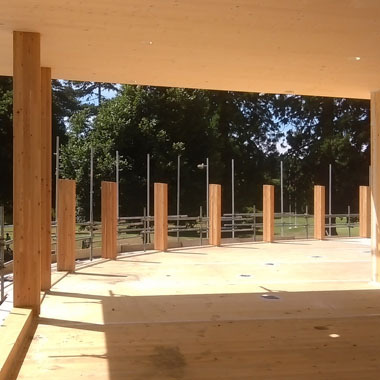 Eurban were on site for only four weeks to install the CLT and glulam elements. There were just four deliveries of CLT so disruption to the ongoing running of the golf club was minimized. There were also Health and Safety benefits due to the early installation of the CLT staircase making the upper floor easily and safely accessible. This enabled safe and early access for follow on trades which further reduced the overall construction time. As CLT is a precision engineered material there is little or no waste. The production of CLT by Stora Enso is a fully BIM orientated process. 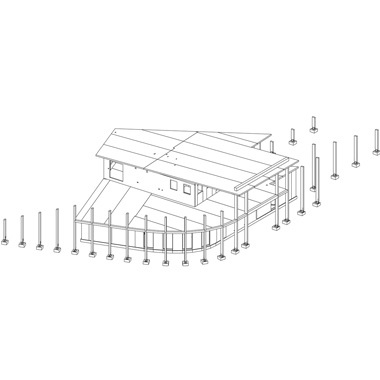 CLT panels are modelled through Eurban’s BIM platform and sent directly to the CNC machine at the CLT mill where they are cut to size including apertures and service channels. This precision engineering ensures accuracy and reduces the need for remedial work or changes on site. Following installation last year Eurban’s carbon assessment of the CLT superstructure shows an embodied carbon saving of 43t when compared to reinforced concrete. 118t of stored carbon in the mass timber frame and 162t of carbon saving which can be used to offset the operational carbon emissions for a period of 18 years. In addition to the very low air pressure testing of 3.92 cu.m/hr.sq.m, the building was over insulated to all the thermal elements and complimented with air source heat pumps that provide the energy for the underfloor heating, natural ventilation and low energy LED lighting throughout. 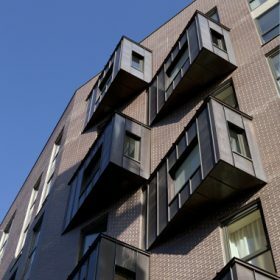 Also a post-occupation as-built BRUKL calculation has been provided confirming an 8.4% improvement to the notional building emission rate and an A rated EPC rating.